“Live-Tech” In-Home tech support is a perfect choice when remote options have been exhausted or just not possible. Our Onsite tech is dispatched to your front door & will professionally take care of all technical problems or new projects you may have. Make Live-Tech In-Home support your next tech visit and assure satisfaction because we guarantee IT! 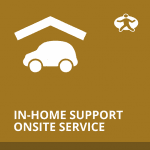 Have questions about our in-home onsite technical support? Contact us today & we’ll be happy to help.